Fantasy football is a conundrum, and far too often the most surprising of breakout candidates are far too obvious in hindsight (We should have seen Adam Thielen coming, guys). 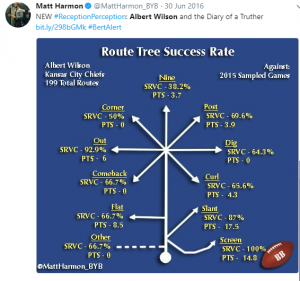 While even the most well-argued “sleepers” fail to pan out year over year, we as obsessed fantasy football gamers can take solace in the fact that hopefully more often than not, our process was correct. This year, one such player has been calling my name in every single draft. In both best ball and dynasty leagues, this player stares at me in the very late rounds with tantalizing upside that for some reason the rest of the world has yet to see. My most owned player in all formats this year is Albert Wilson, and you should be buying too. He finds himself in the middle of a talent, investment, and opportunity Venn Diagram this year: He is a very good player, has significant opportunity in front of him to be fantasy relevant, and a team has spent significant capital on him through a healthy contract. Albert Wilson has actually garnered attention for a while as an under the radar player who has sneakily been very good at football. 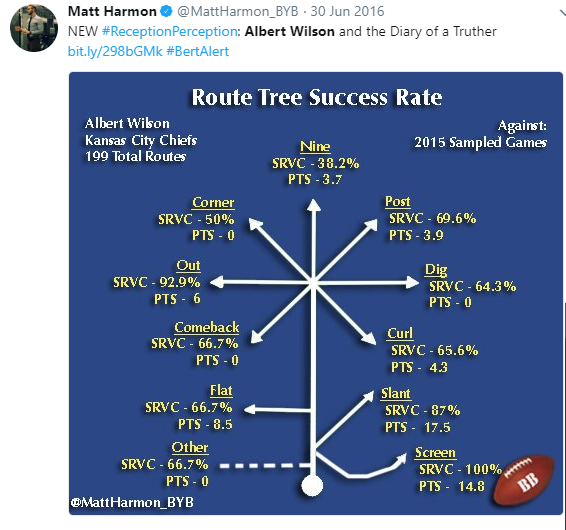 He was first brought to more mainstream attention by one of the GOATs Matt Harmon, who’s Reception Perception in 2016 first highlighted Wilson as a very effective route runner. 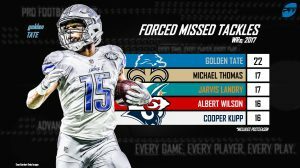 Great scores in Reception Perception have helped uncover many gems like Allen Robinson, Sterling Shepherd, and Chris Godwin in the past, and I see no reason why Albert Wilson can’t join this list of previously unheralded players who have now gone on to greater success in the NFL (Godwin’s time is coming). Furthermore, Albert Wilson ranked #1 in the NFL last season (per Next Gen Stats) in average yards of separation with 4.1, and leads the NFL since 2016 with an average yards of separation of 3.8. This is not a small sample size, and it demonstrates Wilson’s elite ability to create space for himself when running routes. 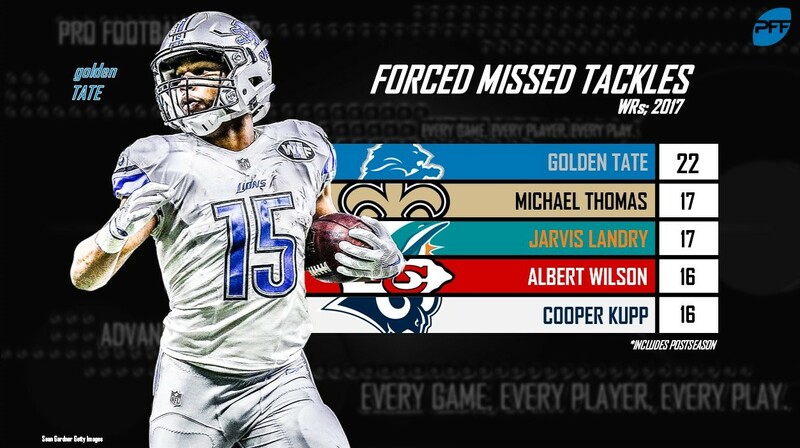 Per PFF, Wilson also had a WR Rating (measures a team’s passer rating when targeting a particular wide receiver) of 123.7, which was the 4th highest WR rating in the NFL last year. The bottom line with Albert Wilson’s elite performance in all of these different efficiency metrics is that he is an incredibly good football player. When Albert Wilson signed a 3 year, $24 million contract with the Dolphins, many people were perplexed. That is a very healthy investment in a player with little statistical production, and many people just chalked it up to the Dolphins being a dysfunctional organization. In reality, however, the Dolphins likely knew how good Albert Wilson was. Wilson’s contract is incredibly important to understand, as these type of investments can be very telling in how a team intends to utilize a player the following season. Looking at just last year alone, the Vikings signed Adam Thielen to a 4 year, $19.2 million contract, the Rams signed Robert Woods to a 5 year, $34 million contract, and the Dolphins signed Kenny Stills to a 4 year, $32 million contract. All three of these deals were criticized by many in the fantasy community at the time, yet all three of these players went on to massively outperform their ADPs and had incredibly productive seasons, with Thielen finishing as PPR WR9, Stills finishing as PPR WR28, and Woods finishing as WR32 while missing a handful of games. Instead of criticizing these deals, we should have looked at what these contracts signaled for the future of these players: opportunity. While Wilson’s contract in and of itself gives him significant potential for opportunity next season, the most important factor is the sheer number of targets available on the Dolphins with Jarvis Landry leaving. There are now 161 targets up for grabs just from Landry’s absence that Albert Wilson is more than ready to absorb. For projections sake, let’s simply give Wilson 70% of these targets. This would give him 112.7 targets, and at his catch rate of 67.7% last year, his YPR of 13.2, and his touchdown per target rate of 4.8%, that would give him a rounded stat line of 113 targets/76 receptions/1,007 yards/5 touchdowns. That is good for 208 PPR points, which would’ve made Albert Wilson the PPR WR16 last year. While many of the efficiency factors I have outlined can rationally be argued as less meaningful because they are not necessarily predictive, volume is very predictive to fantasy points and, as I outlined, the volume should be there for Albert Wilson this year. All of these factors combined should make Albert Wilson at least a mid-round pick in best ball leagues, perhaps at the 8th/9th round turn. As a 25 year old talented yet “unproven” WR, one would reasonably expect him to go around round 11 or 12 in dynasty leagues. His current MFL10 ADP is 204.05, making him available around the 16th/17th round turn. In Dynasty leagues he is routinely available well into the 20th round and even goes undrafted in shallow leagues. He is the easiest buy of the off-season at those prices, as he offers legitimate high-end WR2 upside almost for free. Go draft or trade for Albert Wilson today.